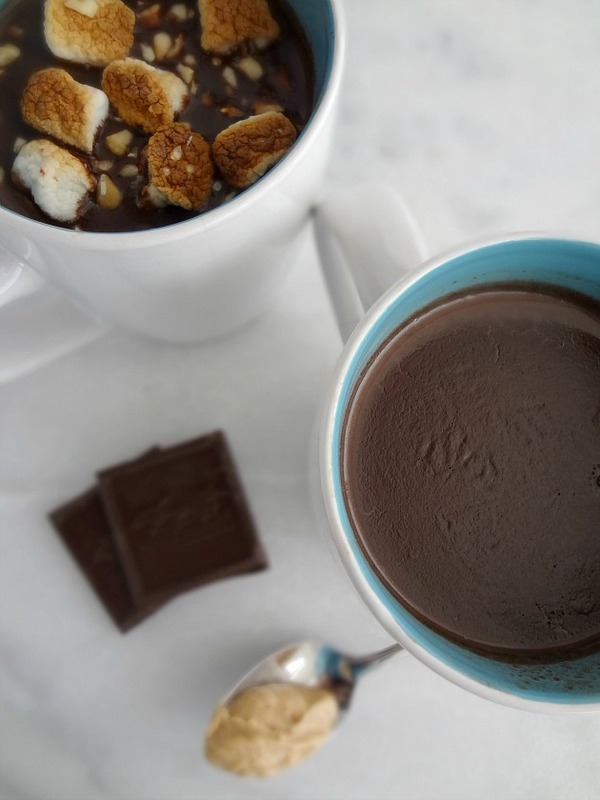 One of the few things that I mostly keep standard on the whole "eating things seasonally" (I'm not not talking about vegetables--I'm talking like ice cream is for summer kind of thing) is that I usually only drink hot chocolate in the winter. But I'm also super picky about it--like...when I tell people that I only drink water and they make the weirded out face and then I inform them that I do occasionally drink orange juice or really good hot chocolate. It's true. I need it thick. I need it rich. None of that watery/milky cocoa powder gunk for me. RICH AND THICK! 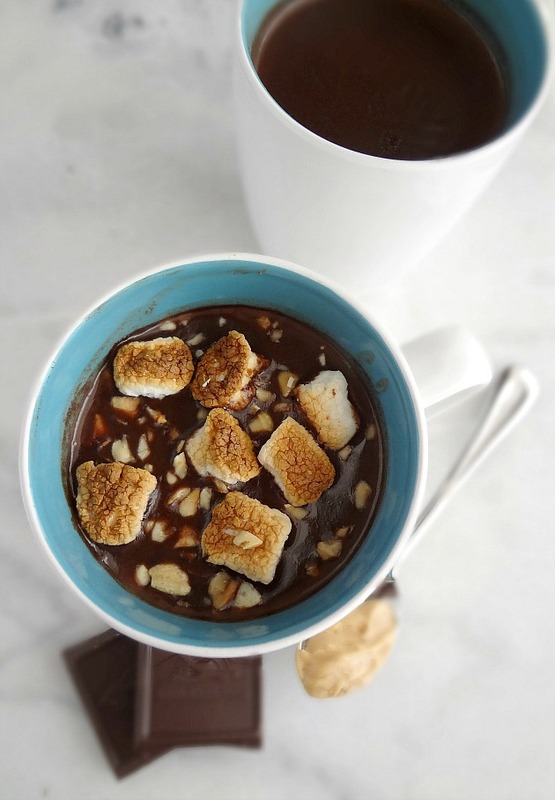 The ultimate epitome of this is Max Brenner's Italian Thick Hot Chocolate, but now that I no longer live in NYC I do not have easy access to that nectar of the gods (although I'm intending to try a copycat recipe soon) so I have to try out other versions myself! 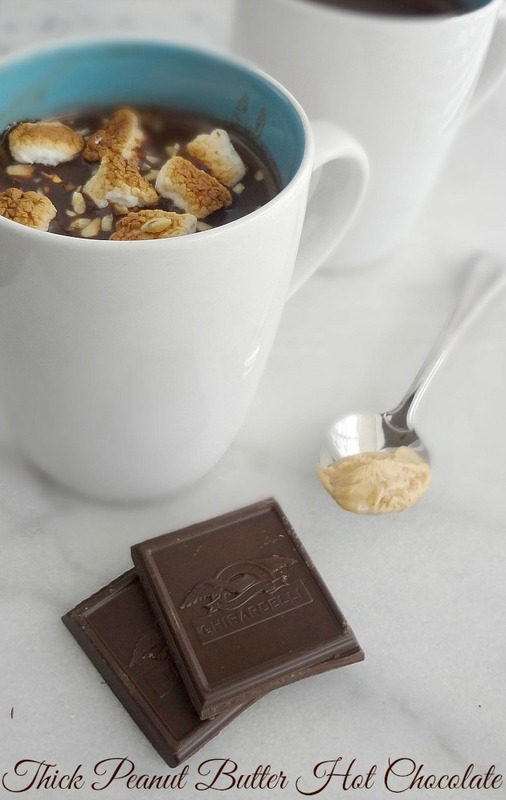 One easy way to make any hot chocolate richer is to add in peanut butter. Instant yum. Which is why this is now def. 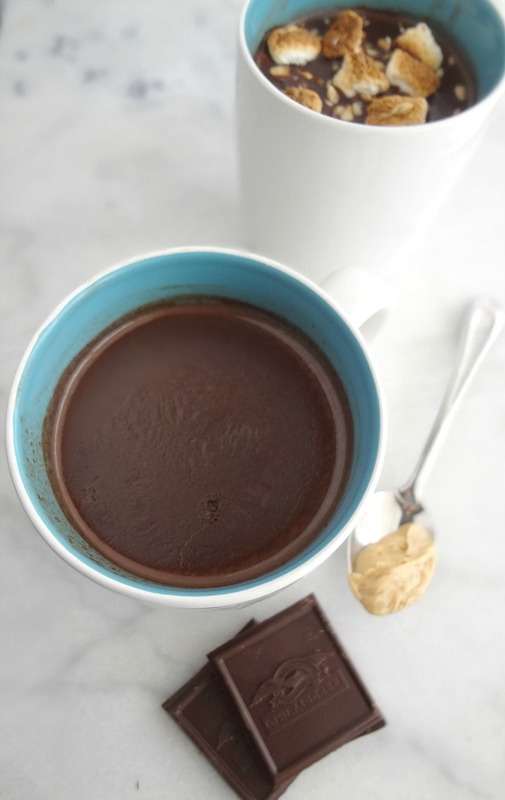 one of my favorite homemade hot chocolates-rich, creamy, fairly thick, and peanut butteryyyyy! I really need to have heavy cream in my fridge at all times-can you imagine how tasty a peanut butter whipped cream would be on top of this??! I can--and it's DARN TASTY! Mind you, I also fully loved my idea to put some toasted marshmallows and chopped peanuts on top. Although I will admit the peanuts might have made it a bit too chewy...hmmm...not sure. Regardless, I enjoyed it. Still not quite as thick as I'd like, but def. better than almost any version I've tried at home thus far. And Michael said it tasted like a melted candy bar, which is pretty much my meter for if I'm going to like it or not. And if you're a smart cookie like me, then you'll love it too! Makes 2 mugs of hot chocolate. Mix together the cornstarch with 1 tbsp. of the milk and set aside. 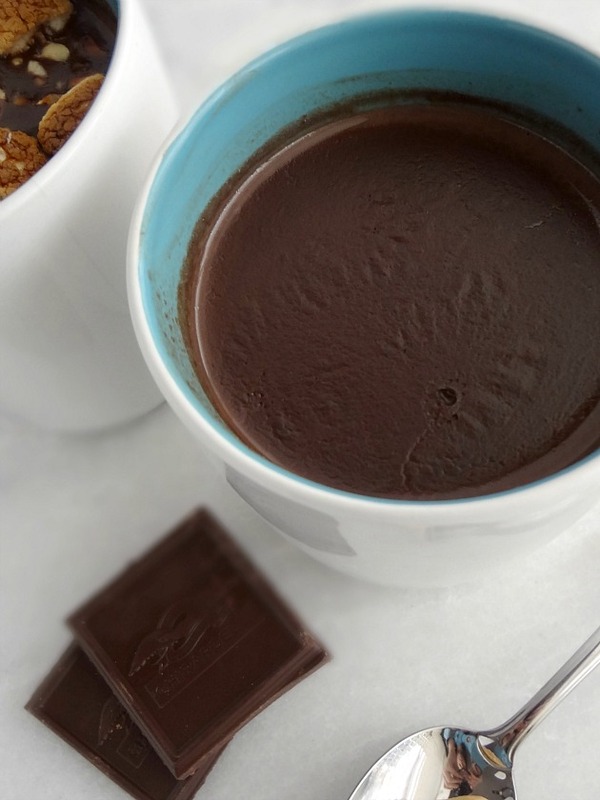 Combine the remaining milk, cocoa powder, chocolate, and peanut butter in a medium saucepan over medium-low heat. Heat slowly, whisking gently and constantly until everything is melted and the mixture is steaming (but not yet boiling). Whisk in the cornstarch and heat until the mixture thickens. Pour into mugs and garnish as desired. Serve warm!